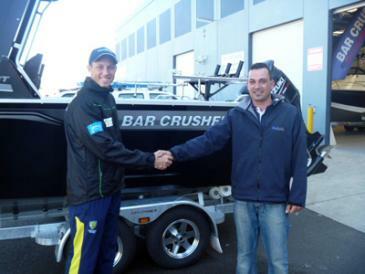 Australian test cricketer James Pattinson recently took delivery of a brand new Bar Crusher 670HT. In between his hectic schedule – which, as well as tests, includes one day international, IPL and Victorian state cricket – James loves nothing more than heading out fishing with his brother Darren… and his well-optioned, all-black Bar Crusher will allow him to do just that! The opening fast bowler’s 670HT is powered by a Suzuki DF175TX for maximum top-end speed, and fitted with digital gauges, twin touch-screen 9” sounder/GPS units, Fusion stereo system, Hella LED lighting and more. Pictured: James (left) was all smiles as Bar Crusher sales manager Matt Urzia handed him the keys to his new 670HT last week.